Red Rum is surely, even today, one of the most recognisable names in horse racing. It’s testament to what he achieved in his career, that even those born well after he’d stopped racing still know who this thoroughbred steeplechaser was. 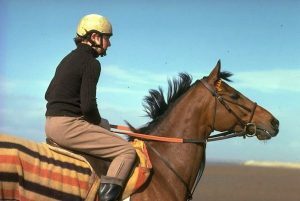 Initially bred to run 1 mile races, Red Rum’s talents were actually better suited to much longer distances, as his future successes would attest to. His brilliance wasn’t spotted immediately and it wasn’t until he was passed to Ginger McCain’s training yard that amazing things started to happen. Red Rum’s crowning achievement remains a one off in racing even today. That being the feat of winning the Grand National three times, in 1973, 1974 and 1977. Casual and serious racing fans alike will realise how difficult the Grand National is, with it’s sizeable fields and taxing jumps, though Red Rum was able to sweep these complexities aside. In the 1973 race he was 30 lengths off the pace and his eventual victory against fellow 9-1 shot Crisp is deemed by many to be one of the best horse racing moments of all time. Even in the ‘gap years’ of 1975 and 1976, Red Rum came second in the National, demonstarting just how much of a firm fixture he’d become in the race during the 70s. In retrospect Red Rum was in very safe hands throughout his time in racing, with Brian Fletcher as jockey for his first two Grand National wins (Fletched had already ridden one National winner in 1968 – Red Alligator) and trained by the talented Ginger McCain. Red Rum’s time in racing ended in 1978 following a hairline fracture, but the nations love for him didn’t and hasn’t diminished. He died aged 30 and a life sized sculpture of this much loved high achiever overlooks the paddock at Aintree, a place in which he made many a memory.